254/365 – “Metamorfoodist” nr.12, a photo by Luca Rossini on Flickr. 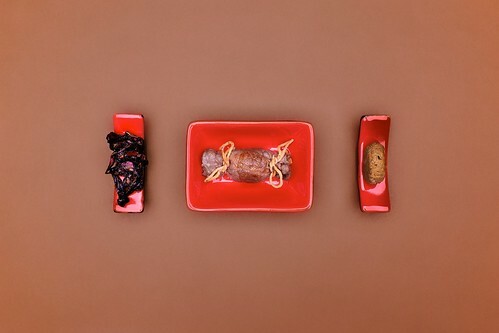 Beef Candies stuffed with Vinsanto flavoured Tuscan Paté and Radicchio Trevigiano Pan-Fried with Balsamic Vinegar (“Caramelle ripiene con Pate’ Toscano al Vin Santo e radicchio Trevigiano Saltato al Balsamico”). This highly nutritious candy won’t be the kids’ favorite: the thinest slice of beef round steak wraps around a heart of Tuscan paté “sfumato” with vinsanto (sfumato means simmered with the wine till reduced). It’s served on one side with a “gnudo” (a small portion) of the same filling, and on the other side with a little nest of radicchio trevigiano pan-fried with Modena’s balsamic vinegar.